What Qualities Do Leaders Need? Leadership qualities are the personal attributes you need to develop if you want to successfully fulfil the role of a leader. There are many leadership qualities, but the top 10 are as follows. Develop a clear vision for a better future. The ability to pick the right people to join the team (and NOT pick the wrong people). The ability to formulate practical and efficient plans, capable of achieving the vision. Decisiveness: the ability to make difficult decisions. Courage: The will to act on a difficult decision, once it has been made. The ability to perceive when a failing plan is wrong and the willingness to change it. The ability to perceive when a failing plan is NOT wrong and the willingness to persist. The ability to self-motivate, self-inspire and to generate a positive attitude, especially during tough times. The ability to inspire in others, feelings of optimism, confidence and motivation. 1. A clear vision for a better future. A leader is leading the people somewhere definite. The captain of a ship has a destination in mind. The captain does not act without a definite purpose. No ship ever drifted into port, carried by the current. No drifter-mentality will ever be an effective leader. Only those people with a clear vision and a definite purpose will qualify as a good leader. All leaders need followers. Therefore, all leaders need to be able to communicate their vision to others. The list of "great leaders" contains the same names as the list of "great communicators". 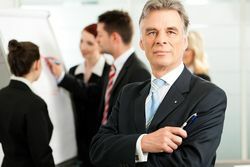 That fact reveals a fundamental connection between leadership and communication skills. 3. The ability to pick the right people to join the team. The leader needs a team of advisors and experts to guide his or her thinking. All great leaders are made great by their colleagues. One of the skills of great leaders is the ability to choose the right people, as well as the ability to avoid picking the wrong person. 4. The ability to formulate practical and efficient plans, capable of achieving the vision. Assembling a good group of people with a vision is not enough. The group needs a practical plan of action that is capable of achieving the goal. A vision without a plan is a dream. A vision tied to a practical plan is a powerful force for change. 5. Decisiveness: The ability to make a difficult decision. A plan is only a theory. Some people have visions and plans, but the plans contain options that require decisions. Push the button or not? A leader is willing to make a decision. Non-leaders avoid making decisions. They delay. They obfuscate. They prevaricate. They are afraid to make a decision for fear of making a wrong one. Leaders are not afraid of making a decision. Leaders are decisive. 6. Courage: The will to act on a difficult decision once it has been made. Once a decision is made the leader acts quickly. Non-leaders are slow to act on a decision; and for the same reasons, they are afraid that their decision may be a wrong one. So, the decision is made but the action is not forthcoming. Leaders act quickly. 7. The ability to perceive when a failing plan is wrong and the willingness to change. Not all decisions are good decisions. Good leaders are keenly aware of that fact. They look carefully at the feedback results their actions are creating and they are willing to reverse a decision if it proves to be wrong. They do not keep repeating mistakes. Poor leaders are obstinate and will not admit they were wrong; and will prefer to keep repeating mistakes rather than reverse themselves. 8. The ability to perceive when a failing plan is NOT wrong and the willingness to keep going. The paradox of leadership is that good leaders also need to know when a plan is fundamentally sound, and is worth pursuing even though the initial results are not good. The good leader is able to see beyond the immediate reality of the situation. They recognise that the basic premise and plans are sound and that persistence is required, to see the plan through to a successful conclusion. In this case the roles are reversed: The poor leader gives up and the good leader keeps going. The trick is to know which situation you are in. To abandon a plan or persevere. To go on, or turn back. This is an act of judgement and good leaders make the judgement correctly. Bad leaders get it wrong. 9. The ability to self-motivate, self-inspire and to generate a positive attitude, especially during tough times. The leaders need to be emotionally self-sufficient. Non-leaders feel the need for validation by others in order to feel strong. Leaders don't need validation from others, they validate themselves. Leaders don't need the approval of anyone. Leaders don't fear the disapproval of anyone. They have what psychologists call an internal locus of control. Meaning they are their own source of power. 10. The ability to inspire in others, feelings of optimism, confidence and motivation. Since the leader is self-sufficient in terms of emotional power, they are able to brew enough at home to have a surplus of energy; sufficient to be able to pass their energy onto others. Leaders inspire others into action by the infusion of their mental energy and enthusiasm. They are able to give away positive emotions to others. That makes them a valuable asset to the rest of the society. All of us benefit from the effects of great leadership. That is why you should develop your leadership qualities. Quiz: Do you have good leadership skills? Take our leadership skills questionnaire to discover if you have the necessary attributes to become a leader. People who lack leadership qualities are inspired by those who do. Check out the top ten leadership skills and discover where you are strongest and where your weaknesses are. How to develop and improve leadership skills? Is there a difference between a leader and a manager?